If you switch off when writers start talking about how they fill their diaries then do click off the screen now. If you’re still here – hello and happy New Year! I’m going to start by returning to 2016. With regards to writing, that year was an exciting one for me. 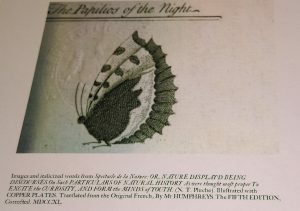 There was the release of my first poetry pamphlet and collection, my role as co-writer and co-performer on the Haunt shows in Harrogate, my first Arts Council grant, lots of performances and the Altofts Lead Artist position. That year was special, not least because decades of work finally came to fruition but also because I created the Altofts commission and began a new body of work with Corseted. 2017 felt a lot less productive with regards to my own work. But rather than worry about this, I decided, like many others as the year turns, to take stock. 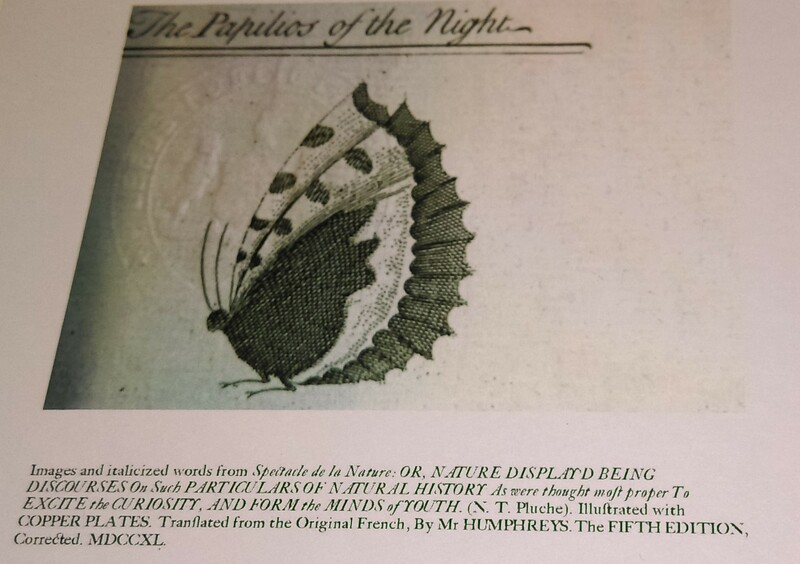 The Papilios Of The Night – an 18th Century naturalist and 21st Century feminist hybrid poem, written for the ‘Bards, Idols and Liars’ exhibition at Leeds Central Library. Email me at write@beckycherriman.com if you’re interested in buying a set of 5 postcards (a stanza on one side and image on the other) for just £5 including p&p and I’ll send you payment details. Apologies if the image quality doesn’t come out well here. They are crisp and clear in the real world. Everything I had published in 2017 was printed in an anthology. There was Writing Motherhood: A Creative Anthology published by Seren and compiled by the multi-talented Carolyn Jess-Cooke, which was recently named book of the year by Wales Arts Review. My poems and flash fiction were published alongside fellow graduates of the Yorkshire Art Circus’s Writer Development Programme in Anthology: A Circa Works Collection and I also had a poem in The Valley Press Anthology of Yorkshire Poetry, edited by Oz Hardwick and Miles Salter. This was a recommended anthology for National Poetry Day. My most exciting publishing news was the utter surprise of discovering I’d had a poem from Empires of Clay highly commended for the Forward Prize. During the ceremony at The Southbank Centre, fellow attendees might have heard my inappropriate whoop as it was announced that Annabelle Fuller, one of our Ilkley Young Writers, had won first prize in the Student Critics Competition. I recently asked Facebook friends about what and how often they were submitting (it varies greatly) and thought it was only fair to post my recent paltry record here. Looking back over my Mslexia submissions diary, I was horrified to find I didn’t submit anything at all until mid-May. I sent my novel to several places and am still waiting on replies from all but two of the agents I sent it to post rewrite. I was prepared for this – I know from experience that novel responses often take months. I sent off poems a total of ten times in 2017. Of these I’m waiting for responses on four, had two shortlisted for respectable publications and one longlisted by Sinead Morrissey for the Mslexia poetry competition. This was the first year I didn’t enter the National Poetry Competition, which felt strange. As I didn’t have anything finished that was a) short enough and b) not earmarked for somewhere else, it was the right decision. I also entered short stories into four high-profile competitions, two of which I’m waiting to hear from. A good proportion of my time was spent on three writing-related applications. I had encouraging noises on two of them and hope deeper connections can be made as a result. As well as the two sell-out script-in hand Corseted performances, I was invited to tour Empires of Clay at some lovely reading events. A performance highlight of the year was sharing a stage with John Hegley and Lynton Kweisi Johnson in a poetry extravaganza with A Firm of Poets, Kate Fox and Laura Potts at Wakefield Lit Fest. In October, the Imove Haunt team had a week long residency in Cheltenham to develop some work with homeless charity P3. It was a privilege to write and perform with bright people with so much courage and potential and the work produced was both honest and original. It culminated in two performances at the theatre and was one of my favourite ever working weeks. I spend much of my time running creative writing and combined art workshops and 2017 was no different. There were a couple of invigorating one-off workshops, one at a First Story conference in the summer and another for Love Arts with movement artist Kim Glassby. I continued my work as co-facilitator for Ilkley Young Writers and Bradford Young Writers with Michelle Scally Clarke. Ilkley Young Writers are currently working on a poetry musical, which is proving to be a fascinating learning experience for the group and for us. We hope it will premier in the late spring. Artlink have now completed their massive three year project ‘Get Started’ and have progressed to the next phase, which they have aptly entitled ‘Moving On’. Along with Rozi Fuller, I have been made co-leader of Working Together – a steering group of adults with learning disabilities. We seek to nurture participants to develop as artists, increasing ownership of their work and to become representatives of the Moving On project. As part of this project, I’ve been running CPD sessions with staff members and employ an in-depth ethnographic approach to evaluation as developed by Dr Anni Raw. Alongside artist Milena Dragic and in conjunction with Artlink West Yorkshire, I’ve run two projects at Ripon House Bail Hostel with women prison leavers. At times this has been challenging, at others deeply enriching ­­– sometimes both at the same time. We were delighted to find out in December that the women won a silver in the Kostler Awards for their group artwork and various awards for their writing, including a bronze for a poem. You can read my latest blog about Working Together and more about Artlink’s work here. I’ve been working closely with a writer on a book about her travels in the Scottish isles and advising another who is writing a human rights memoir. It is a privilege to work intensively with committed writers and see their projects unfurl and blossom. I judged the 2016 Mother’s Milk Books Prize for the adult and child poetry categories. You can read the winning poems and results on the Mother’s Milk website. In October I began blogging reviews of books (and other works) by women. Parkinson’s has really buried its teeth into my dad over the last fourteen months so I’ve been driving over to Ripon to spend time with him for half a day a week. This involved taking him swimming until he fractured his hip after unadvisedly riding his bike (very typical of Dad). Now it mostly involves going out for lunch and playing dominoes. People talk a lot about the struggles of caring for a family member with dementia (my step-mum is his full-time carer and we are in awe of what she does for Dad) but you don’t often hear about how this can be an opportunity to get closer to someone. I find our Monday afternoons a real time to treasure. Like many people I had ups and downs with health over the last year. I’m grateful in particular that the few months I had with trigeminal neuralgia (which I hope none of you ever experience) are over. I’m also aware some readers are facing far more difficult situations and send well wishes to those of you who are battling at present as well as those who have suffered recent losses. Corseted – I have been making more links and working on a proposal with Little Mighty which we hope to submit in early 2018. The plan is to build on work done but to take the show in a very different direction. Eclectic as ever, I know but I believe an idea determines its own form and who am I to stand in the way of that? I advise participants to write only what they are passionate about and try to abide by that guideline myself. (Un)fortunately I am interested in a variety of forms and themes and this means my own work tendrils out in different directions. In a concerted effort to submit more, I’ve sent off seven poems already this year and pledge to keep up a better record of submissions. I’m not setting a target as the quality is far more important to me than numbers. The mentoring and workshop projects mentioned above will continue. I’m also looking forward to beginning work with the Ted Hughes Project on a Doncaster schools project this month and being involved with some festivals later in the year. I’ll write more reviews of books by women but I intend to be selfish in that what I review will be based purely on what I want to read. I take my time writing them so they will be sporadic. I’m one of those people who has a tendency to spread myself too thin. I am going to try even harder not to do that this year by being realistic about how long things take, making time for my nourishing Pilates class, spending less time on social media and trying to keep weekends and evenings free of non-writing work where possible. 2.2.18, 13.30-16.00 pm, Meet and Make Workshop with a creative writing focus, Leeds Art Gallery. Details tbc. ‘Women Of Words is a monthly spoken word event providing a platform for the female voice. We believe it’s really important that women have spaces where they can find their own voices, define themselves through creativity and the sharing of ideas. We believe that sharing words is one of the most powerful ways to do this – so that’s what we invite you to come and do! Thanks for posting all your news and achievements Becky. I sympathise with what you say about quality, not just quantity, being important for work being sent out whether submissions or competitions. May 2018 be a fruitful year for you, in every respect. And for you, Moira. Hope to see you there. Really great to read your blog Becky and to see how it is all growing and coming together. I look forward to seeing your next performance when the chance arises!